Students will be able to write in accordance with different author's purposes. To begin, inform your students that when people write, they write with a specific Author's purpose, or reason for writing, in mind. Explain that there are three components to author's purpose, expressed with the acronym PIE: to PErsuade, to INform, and to ENtertain. 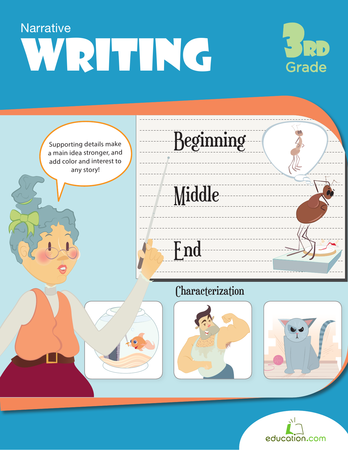 Let them know that they will be authors for this lesson, and write for each purpose. 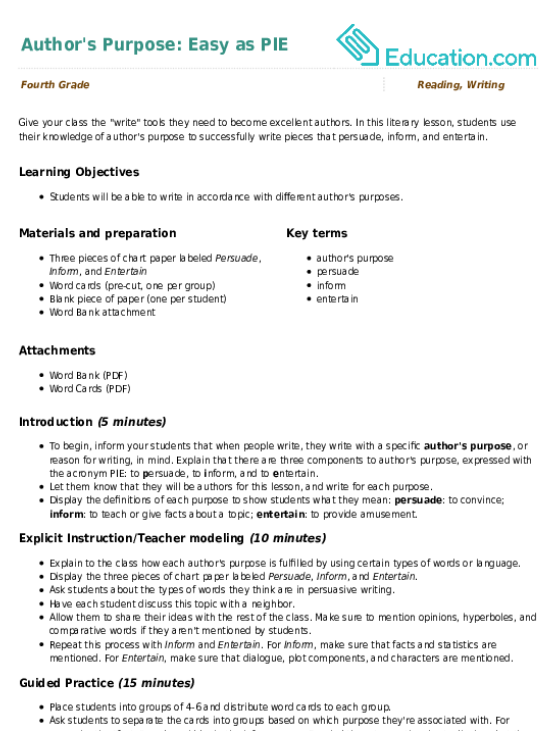 Display the definitions of each purpose to show students what they mean: Persuade: to convince; Inform: to teach or give facts about a topic; Entertain: to provide amusement. Explain to the class how each author's purpose is fulfilled by using certain types of words or language. Display the three pieces of chart paper labeled Persuade, Inform, and Entertain. Ask students about the types of words they think are in persuasive writing. Have each student discuss this topic with a neighbour. Allow them to share their ideas with the rest of the class. Make sure to mention opinions, hyperboles, and comparative words if they aren't mentioned by students. Repeat this process with InformAnd Entertain. For Inform, make sure that facts and statistics are mentioned. For Entertain, make sure that dialogue, plot components, and characters are mentioned. 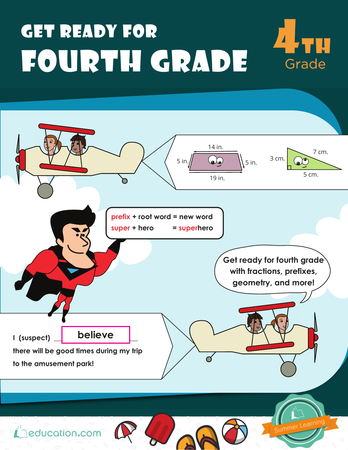 Place students into groups of 4-6 and distribute word cards to each group. 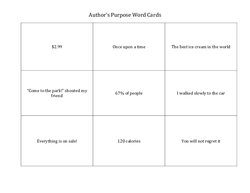 Ask students to separate the cards into groups based on which purpose they're associated with. For example, the "facts" card would be in the inform group. Remind them to use the charts displayed at the front of the room for guidance. After each group has completed the activity, review the answers as a class. 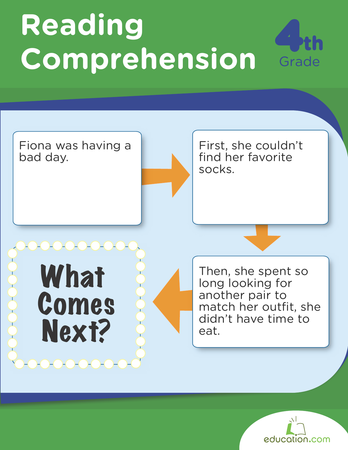 Ask students to explain their reasons for placing word cards into certain groups. Identify any word cards that may be put into more than one category (e.g. $2.99, which could be grouped into both the persuade group and the inform group). Have students call out different types of pie (e.g. pumpkin or apple). Ask them to each choose a type of pie, and let them know that they'll be writing about this pie for the different author's purposes. Hand out blank pieces of paper. 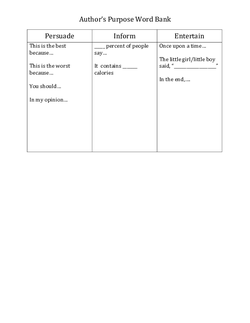 Have students fold the paper into three equal columns and label the columns with a P, I, and E.
In the PColumn, students will write to PersuadeTheir audience that their pie is the best (or worst) type of pie. In the IColumn, students will write to InformTheir audience about their pie. In the EColumn, students will write an entertaining story that includes their pie. Ask students to write at least one paragraph for each purpose. Remind them to use the charts at the front of the room to check what type of language should be included with each purpose. Enrichment:Have advanced students write a fourth paragraph that includes more than one author's purpose. Have these students exchange papers with one another to determine which two purposes were used. Support:Give students the word bank provided to help guide their writing. During Guided practise, circulate the room to determine whether students are able to properly separate words and phrases for each author's purpose. Use students' written responses from Independent Working Time to see if they grasped the concept of writing for different author's purposes. Have 3-5 students share one of their written responses without telling which purpose the response is for. After each student shares his response, have the rest of the class vote on whether the purpose was to persuade, inform, or entertain. Call on students to explain what they heard in the writing that tells them which purpose they are writing for. In this literary lesson, students use their knowledge of author's purpose to successfully write pieces that persuade, inform, and entertain.